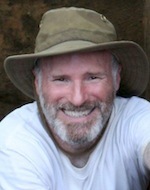 Robin A. Beck, an archaeologist at the University of Michigan, is part of a research team that discovered Fort San Juan—originally established by the Spanish—in the Appalachians. It is now the oldest known European settlement in the interior of what is now the United States and predates by almost 20 years the lost English colony of Roanoke. Like so many good days in archaeology, this one came on what was supposed to be my last day of the 2013 field season. For more than a decade, I had been working at the Berry site in western North Carolina with my colleagues Dave Moore (Warren Wilson College) and Chris Rodning (Tulane University). Berry is the location of a large American Indian town that was occupied from the 1400’s into the seventeenth century. What makes the site especially important is that our work suggests it was the native town of Joara, visited by both the Hernando De Soto expedition (1539-1543) and the Juan Pardo expeditions (1566-1568). 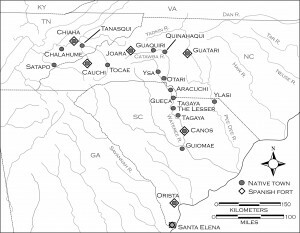 Historians and archaeologists alike have long been interested in tracing the routes of these Spanish explorers across the American Southeast, since doing so would allow us to connect the written accounts of the expeditions to the archaeological evidence of this region’s native peoples before and after their first encounters with Europeans. We could, in effect, create a roadmap of the sixteenth-century Native South, one that we could then trace forward and backward in time. To make it happen, though, we needed an anchor point—a place that we could conclusively identify as one of the Indian towns described in expedition accounts. That’s where Berry—and our good day this summer—comes in. De Soto was only at Joara (his chroniclers called it Xualla) for a few days in 1540, and so we would expect there to be few traces of his stay there. Pardo, however, built a fort at Joara—Fort San Juan—that was occupied by 30 Spanish soldiers for nearly 18 months before being destroyed by its American Indian hosts. We would expect this occupation to have left a significant archaeological footprint at the site of Joara, and indeed, my colleagues and I had argued for years that we had evidence of this footprint at the Berry site. But when the colored soils we thought were different levels or stages of the mound took an unexpected right-angle bend, we knew we were dealing instead with something dramatically different. We had Spanish artifacts that date to the right time, the kinds of artifacts we would expect at the site of a Spanish occupation: Spanish pottery, nails, lead shot, iron clothing hooks, and copper lacing tips. We had identified and partially excavated several burned buildings that were full of timbers cut and shaped with metal tools. We were convinced that these buildings housed the men that Pardo stationed at Joara. What we lacked—what had proved elusive for so long—was evidence of the fortification itself. Where was Fort San Juan? We finally got our answer in June. We were focusing on what we thought was the southern edge of the platform mound we know the Indians built at the Berry site. Smithsonian archaeologists described it as 15 ft high in the nineteenth century, though it was bulldozed in the 1960’s. But when the colored soils we thought were different levels or stages of the mound took an unexpected right-angle bend, we knew we were dealing instead with something dramatically different. 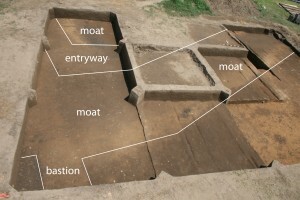 That Friday, what was supposed to be my last day, I took cores from the colored soils to see how deep they were, and we realized that what we had exposed was about 18 m (60 ft) of a long ditch—the dry moat of Fort San Juan, the earliest European fort in the interior of what is now the United States. After a bit of negotiating with my family, I stayed on for an extra week to excavate a cross-section of the moat, which turned out to be 3.5 m (11.5 ft) across and nearly 2 m (6 ft) deep. While finding a ditch might not seem to compare with finding a pharaoh’s tomb, it is the most important and exciting discovery of my career as an archaeologist, and it promises to guide much of our work at the Berry site in the years to come. Listen to Robin Beck talk to PRI’s “The World” about the discovery of Fort San Juan.